A team of three riders will cycle 100 miles through London and Surrey this weekend in support of our work for seafarers’ welfare. 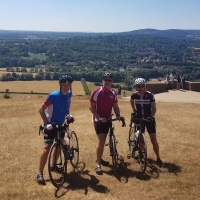 The team, including our Executive Director Roger Harris, will take part in the Prudential RideLondon-Surrey 100 this Sunday (29 July) to raise funds for the International Seafarers’ Welfare and Assistance Network (ISWAN). The 100-mile route through the capital and Surrey countryside was made famous by the world’s best cyclists at the London 2012 Olympics, and 25,000 amateur cyclists are expected to take part in the event this year.